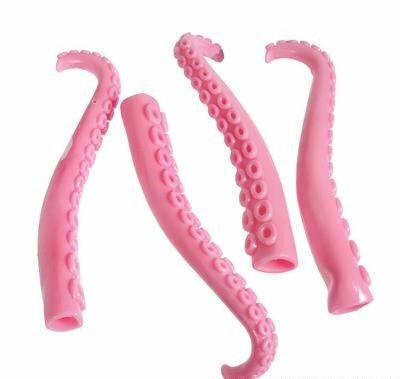 TRANSFORM YOUR EXTREMITIES into that of a flexible creature of the sea with the finger tentacles. Each tentacle fits snugly over each finger and makes it appear as if you've got four seven inch long rubbery tentacles chock-full of suction cups along the bottom. GREAT FOR PARTIES! These finger puppets are handy party favors that double as party activities. These also make fun Christmas stocking stuffers and Easter basket treats. KEEP YOUR YOUNGSTERS AND THEIR FREINDS OCCUPIED FOR HOURS. Great activities for the classroom or for rainy day playtime. FUN FOR PRETEND AND IMAGINATIVE PLAY. Pretend you're an octopus when your fingers transform into tentacles or organize a puppet show for the kids for some great entertainment. BUY WITH CONFIDENCE! High Quality Non Toxic Lead and Bpa Free. Backed by Neliblu 100% money back guarantee and manufacturer's warranty when purchased from an authorized reseller. 100% brand new and high quality toys.